Minor Briton kingdom in the bordering Northumbria and Strathclyde. Low-rising mountain range, proliferrated with moors, that forms the eastern borders of the lands of South and North Rheged. In fact, it is all that currently seperates Rheged from the Angles of Northumbria. This high moor has the remains of a Roman road cutting its way across the western moors and then through the southern Pennines. The Roman road linked Mamucium (Caer Mam) with Eburacum (the Angles' York). Died, along with his realm, in the Bernician (Angle kingdom) invasion of 595 A.D led by King Aethelfrith. Another noted casualty was Queen Neued (wife of King Llywarch of South Rheged and sister to the queen of Northern Pennines). Also know as Umbria or just Rheged at various times. Rhun is King Llywarch's cousin's (the deceased King Urien's) grandson. In fact he was about 20 years old when Llywarch inherited the throne of South Rheged. Rhun married and left his homeland to live in Gwynedd before returning to North Rheged in 601 A.D, following the death of his wife Ellyiw. Relations between North and South Rheged have improved since Rhun took the throne six years ago (at the age of sixty). Killed in battle in 593 A.D. when his realm of North Rheged was beaten in battle by King Morcant Bulc of Bryneich. The realm plunged into chaos and continued without a king until 601 A.D. when Prince Rhun returned. Defeated by Northumbria in 624? King’s fortress with a village in surrounding area. The walls from the old Roman fort are mostly intact, but few buildings remain within. All Briton dwellings are wooden or stacked stone. The king’s palace is a combination of old stone foundations and wooden additions. Includes temple to storm god Taranis. Chief wizard of King Llywarch when Tadhg arrived at Caer Brem. Tadhg served as his apprentice before Govannon died in 597 A.D. Served King Llywarch from Caer Brem. Rolen trained under him until Thaedras' death in 619 A.D when an ogre slave dropped a log on him. The mountain pass above Caer Brem, where the River Ribble forms. King Llywarch's army gathered here at the beginning of the campaign. Village (pop. 600) around small Roman fort where the River Darwen meets the River Ribble. A double tree-trunk bridge crosses the Ribble here. The Roman road is still used. Bel has become a central trade village especially due to its proximity to the king’s caer. 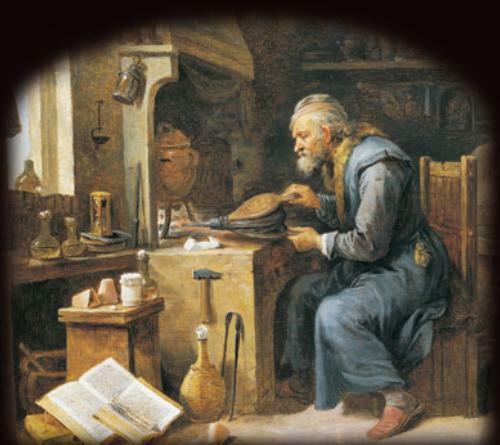 Alchemist loyal to the king. Helped the PCs with fire substances before their two forays against trolls. Border fort in the northern part of South Rheged. Abandoned c570 A.D due to increased raids from fellow Britons of Northern Pennines. Runs winehouse on central corner in Caer Mam. PCs stayed on the floor there and endeared themselves to Edern. A main fort guarding the road through the mountains. The Britons still occupy the sight and the Roman stone foundations are mostly intact. Prince Anarawd commands the strong and disciplined forces here. Site of Roman fort and settlement. Most of Roman dwellings intact and still used. Has a small faction of the Bloodghost Syndicate based here (from Wales). Town at the confluence of the rivers Mers and Vardar. Has ferry crossings. (See “King of the Trollhaunt Warrens” adv). Spent the better part of a year as Skalmad's valet, scribe and interpreter, until the PCs rescued him. He seemed a fearless fellow and avid follower of Taranis, and has always wished to meet "Taranis' Winged Emissary from Brem". He aims to establish a church to Taranis in Moonstair. Attractive, dark-haired half-elf that seems more interested in Moonstair's economic growth than its defense. Tadhg spoke to her about the missing Eiddoel. She told him Bax was the only survivor and got uneasy when Tadhg mentioned they found Gandwy's body on the way to Moonstair. She escorted PCs to a place to stay and later delivered a sack of gold from the mayor insisting the PCs hunt the trolls that killed Prince Eiddoel. She admired the PCs. Large dark forest straddling the lands of North and South Rheged. Surface drow clans vie for control of this forest. It has also become a refuge for trolls. Broad and strong river that flows around the northern reaches of the Trollhaunt. (Means - Border River – old border with the troll realm of Vardar). Clear and fast-flowing river considered sacred to the people of South Rheged. The king's Caer (Brem) lies near its banks and the nearby town of Bel straddles its banks where the Ribble meets the Darwen River. 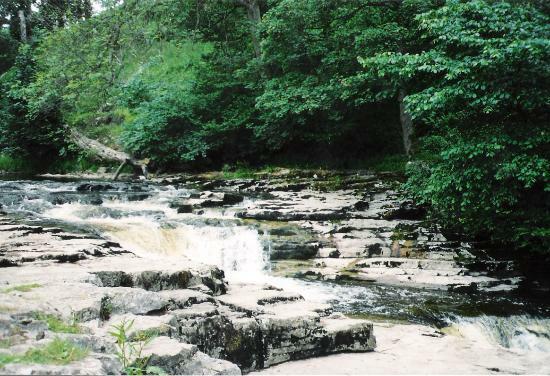 (Picture of the River Ribble in the mountains). Named after the ancient troll realm of this area, this river marks the southern boundary of the Trollhaunt, joining the River Mers at Moonstair. Elven woodland community near the North Rheged border. They have long been loyal to the crown of South Rheged and have provided the realm with some of its best scouts and rangers. 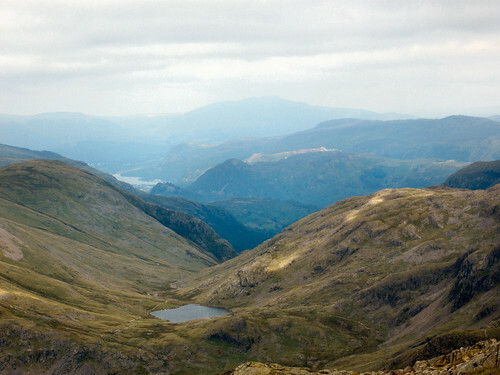 Moors and marshland in southern South Rheged, east of Moonstair and the location of the ancient troll kingdom of Vardar. A troll said to have arcane powers gained from a magic eye (most likely formorian magic). He aims to bring back the ancient kingdom of Vardar in the current Trollhaunts. Supposed slayer of Prince Eiddoel. Llywarch is in his 80's and has ruled for most of his life. He has a large family, including six living offspring, and many grandchildren. His wife, Queen Noued, died in 595 A.D. in an Angle invasion of Northern Pennines when she was visiting her sister there. King Llywarch rules from Caer Brem. The death of the King's fourth youngest child, Eiddoel, was the campaign kicker. All PCs serve the kindly Llywarch. (Pictured with his father, King Llywarch, above). The most robust of all King Llywarch's children, Anarawd has attuned himself to the spirits of the world and is a powerful warden. He is the ninth child of the king and currently leads the troops at Caer Rigod, guarding an important pass through the Pennines. He performed a great act for the Britons by killing the King of Mercia, Pybba (who was raiding into South Rheged) in 606 A.D. Some hero worshippers throughout Rheged refer to him and the "King-Killer". Fourth child of King Llywarch of South Rheged. Ascaraid was a fit man, but uninterested in battle or leading men. He left for a life in Wales and serves as an ambassador in the Welsh realm of Luitcoyt. The seventh child of King Llywarch. Being the seventh child of a seventh child, Eiddoel was destined for greatness. He achieved hero status taking on many small missions for the realm with a highly skilled warband. He was a strong warrior and led by example. He died the year the campaign started and was the reason for the PCs heading south to Moonstair. Eiddoel had died trying to protect the settlement from trolls and he had the realm's heirloom with him. Eighth child of King Llywarch who died in 591 A.D. (at age fourteen) of a mystery illness. Third offspring of King Llywarch. Whereabouts unknown. He left for a monastery on an island off Pictland (Iona?) many years ago. He would be about 55 years old and was also known to possess his father's charisma. Eldest son of King Llywarch. A recluse that learnt to combine arcane power with swordplay (from an eladrin friend) late in life. In fact it was too late in life. He died on a mission into the Underdark in 599 A.D (aged 40). Charismatic second child of King Llywarch and current heir to the throne - though is unlikely to take it. She was a warlord of little renown and began the training of her younger sister Gwenabwy. She is now retired at Caer Brem, her husband long dead. (Gwenabwy pictured above) These twins were King Llywarch's fifth and sixth children. 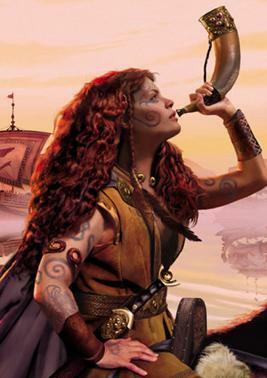 Gwaeddan, a skilled and tough mounted soldier, died in the fire at Caer Brem in 618 A.D. Gwenabwy is the people's heroine of the times and likely heir to the throne (given the three living siblings older than her are unlikely to want it). She is the greatest warlord these people have known and at 47 she is an important leader and inspiration on any battlefield. Considered the 'black sheep' of the South Rheged royalty, Gwenddydd was the tenth (and youngest) of King Llywarch's children and became a wizard (a profession not at all associated with this family). She fell in love with a Briton that lived with and supported the Angles of Northumbria. When her father forbid her to marry, she fled to Northumbria. Loyal protector of Prince Eiddoel. He was the supposed only survivor of the troll attack on the Prince's warband. Tadhg approached him in Moonstair and brought up the finding of Gandwy's corpse. To that Bax tried to kill Tadhg, failed and fled, diving into the river to get away. Wizard living in a Roman tower in northern South Rheged. Was saved from Angle raiders by Kavaki and Tazrak, who he recommended to his associate, advisor of Llywarch, Tadhg. Assigned to Prince Eiddoel's warband after Tadhg retired. PCs found his mangled corpse hanging from a tree north of Moonstair. This was odd, as it was believed he had perished with Eiddoel fighting trolls in the Trollhaunt east of Moonstair. Minor kingdom of Britons constantly pressured by Northumbria and the Picts, and occasional clashes with Dal Riada.